Steven (Chicagoland, United States) on 14 January 2010 in Plant & Nature and Portfolio. In my quest to get to the southern breakwater to capture photos of the morning sunrise, I was wondering where all the "creeking" noise that was heard was coming from. When I got to the breakwater, the answer was right in front of me and captured here. 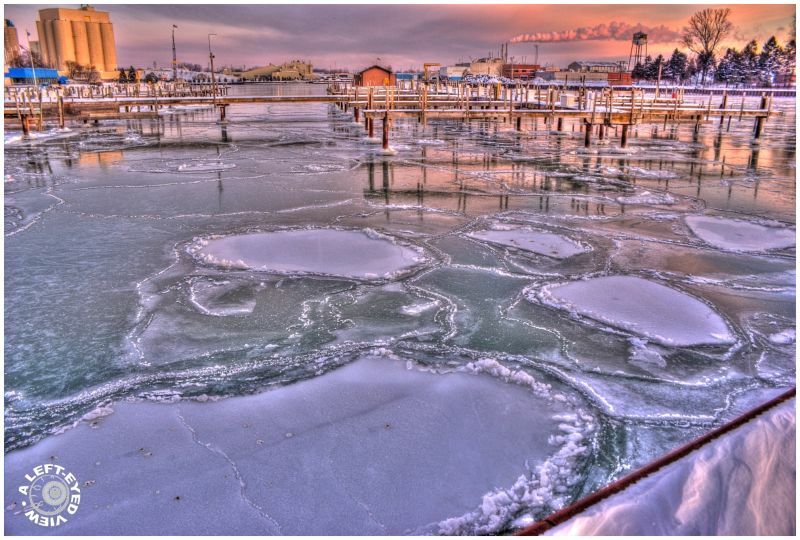 The individual ice "plates" were expanding and rubbing against each other and the breakwater, creating the creeking noise; sometimes quite audible! I think that the white flaky stuff on top of the ice plates must be ice that is getting crushed between the plates as they expand. When I first spotted these "plates," they reminded me of a world map and its different continents. It's interesting to see how "cloudy" some of these plates are. Is it reflective of the frozen state these plates are in? Do the plates become clearer as they freeze? Seen in the background are remnants of what was part of Waukegan's early days as an industrial port. The smokestacks belong to Midwest Generation, formerly Commonwealth Edison. To the left are silos for LaFarge Cement and St. Mary's Cement. The LaFarge silos are commonly referred to as the "12-pack." very interesting. it has produced a very beautiful and somewhat alien scene! Nicely done ! A very nice image ! Nicely done Steve, although the warm colour temperatures struggle to convey the sights and sounds of ice and snow rubbing together. I'd hate to ask what the temperature was if ice was forming on moving water. @Curly: Everything seen in the photo shows frozen water. No "moving water" was evident until outside the harbor. The temperature at the time (7:20 AM) was about -3 degrees fahrenheit. What really hurt was the wind. Again, you really have your own stylish HDR post-processing Steven. A real signature. This one is strong, revealing cold and ice. Nice image with a great processing (HDR ?). A beautiful and good picture, good taken from view, the ice and snow goes into HDR, bravo! Surreal as well as beautiful! I think the clearer ice gets, the less air bubbles it contains. So these plates would be rather young. @MadScientist: Thank you for confirming my suspicions! MadScientist took the words right out ofmy mouth. Nice photo. Creative. I especially like the light on the chimney smoke, and how my eyes are drawn to that part of the image almost directly. I like your thoughts about the analogy between the ice and the earth plates. I agree with MadScientist. In addition the bubble density in ice depends also on the speed of the phase transition (quick or slow freezing). Nice capture Steven, I have heard that sound many time and it almost always amazes me. I hope you were bundled up when you took this. I can see that there was quite a wind from the horizontal steam coming out of the smoke stack in the background. Super shot ; Super processing ! These tones are really wonderful ! surprising, very beautiful production! Magic..
A super shot of these ice flows and thew city beyond. I like that warm light in the sky and on the 12 pack. Nice camera work. Interesting stuff. Cool title regarding the ice floes. I'm not sure of the properties of ice and it's levels of translucency. I would guess there was some air in there.. maybe some motion that made them not as clear as they would be in an ice tray but why the surrounding area changes.. part of natures mysteries [and scientists textbooks I'm sure!] . Mystery solved! Great info and a fantastic shot. Great HDR and photography... and you might be on to something there... I wouldn't be surprised to see an article in science daily wherein scientists studied this effect and the raising of mountains and earthquakes when the plates crash together... Very well thought. Also like the analogy between the ice and plate tectonics. Love the smokestacks and enjoyed your information; this harbor image is superbly cast.